Hutchinson's only Full Service Lawn, Landscape and Irrigation Company! We take a lot of pride in the lawns we maintain and always offer our best in quality and service. Every possible step is taken to make your lawn look its best. 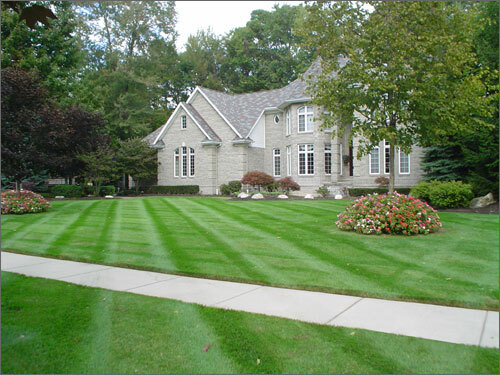 After all, the appearance of your lawn is a reflection of us and our service. We also offer large area finish and rough cut mowing and brush hog mowing. Scott's Professional Landscape, Inc is a full-service company that is capable of handling all of your needs. We strive to provide our customers with everything they are looking for under one roof. In everything that we do, we see to it that every bit of work is done to the highest professional standards. And rest assured we stand behind everything we do. Please contact us for more information on anything we have to offer. ​When it comes to landscaping, we do it all. We have the equipment and knowledge to tackle any size project whether you want a tree replaced or would like to have an entire new landscape installed. We are your local water feature and hardscape specialists. Our landscaping services include: Design, Installation and Maintenance. Proper watering of a lawn promotes its overall health throughout the year. Our trained professional technicians can handle all areas of lawn and landscape irrigation. We install only Rain Bird Commercial components to ensure many years of trouble free service. Our irrigation services include: Design, Installation, Maintenance and Repair. Christmas light installation is more than just a way for us to stay busy. Our customers asked us to help them and we answered. Our safety oriented crews have allowed our customers to no longer climb around on steep roofs and ladders. We have the equipment and techniques to complete the job safely. From small to large, we can make any size home look fantastic and we will ensure that your lights stay lit the entire holiday season. We will also store your lights for you after we take them down. Snow removal has the ability to make or break a customer relationship. Because of this, our snow removal service is second to none. We are on-call before the weather gets nasty and stay on-call until the storm has completely passed. Our goal is to take care of the snow and ice before you have to call. You can rest assured that your property will be safe and fully accessible throughout the snow season. When we fertilize your property, we are using the same Winfield Solutions fertilizers used on some of the most elite golf courses in the world. Our 6 Step Fertilizer and Weed Control Program is our basis for tailoring a custom program that suits your individual needs. We guarantee your lawn will be green, healthy and weed free.